WHEELS: 18 5-SPOKE (R31) (STD), WHEEL LOCKS, TIRES: P235/55R19 ALL-SEASON RUN-FLAT, SMARTPHONE INTEGRATION PACKAGE -inc: Android Auto, Apple CarPlay, Smartphone Integration, SILK BEIGE/BLACK MB-TEX, MB-TEX UPHOLSTERY, REAR SEAT ENTERTAINMENT & COMFORT ADAPTER, REAR CHROME TRIM, PREMIUM PACKAGE -inc: KEYLESS GO, SiriusXM Satellite Radio, PORCELAIN FABRIC HEADLINER, POLAR WHITE. This Mercedes-Benz GLC has a strong Intercooled Turbo Premium Unleaded I-4 2.0 L/121 engine powering this Automatic transmission. *These Packages Will Make Your Mercedes-Benz GLC GLC 300 The Envy of Your Friends *BLIND SPOT ASSIST, Window Grid Antenna, Valet Function, Urethane Gear Shift Knob, Turn-By-Turn Navigation Directions, Trunk/Hatch Auto-Latch, Trip Computer, Transmission: 9G-TRONIC 9-Speed Automatic -inc: DYNAMIC SELECT, Transmission w/TouchShift Sequential Shift Control w/Steering Wheel Controls, Tracker System, Towing w/Trailer Sway Control, Tires: P235/60R18 All-Season Run-Flat, Tire Specific Low Tire Pressure Warning, Tailgate/Rear Door Lock Included w/Power Door Locks, Systems Monitor, Smart Device Integration, Side Impact Beams, Roof Rack Rails Only, Roll-Up Cargo Cover, Rocker Panel Extensions and Black Wheel Well Trim. *Stop By Today *You've earned this- stop by RBM of Atlanta located at 7640 Roswell Road, Atlanta, GA 30350 to make this car yours today!WHEELS: 18 5-SPOKE (R31) (STD), WHEEL LOCKS, TIRES: P235/55R19 ALL-SEASON RUN-FLAT, SMARTPHONE INTEGRATION PACKAGE -inc: Android Auto, Apple CarPlay, Smartphone Integration, SILK BEIGE/BLACK MB-TEX, MB-TEX UPHOLSTERY, REAR SEAT ENTERTAINMENT & COMFORT ADAPTER, REAR CHROME TRIM, PREMIUM PACKAGE -inc: KEYLESS GO, SiriusXM Satellite Radio, PORCELAIN FABRIC HEADLINER, POLAR WHITE. This Mercedes-Benz GLC has a strong Intercooled Turbo Premium Unleaded I-4 2.0 L/121 engine powering this Automatic transmission. *These Packages Will Make Your Mercedes-Benz GLC GLC 300 The Envy of Your Friends *BLIND SPOT ASSIST, Window Grid Antenna, Valet Function, Urethane Gear Shift Knob, Turn-By-Turn Navigation Directions, Trunk/Hatch Auto-Latch, Trip Computer, Transmission: 9G-TRONIC 9-Speed Automatic -inc: DYNAMIC SELECT, Transmission w/TouchShift Sequential Shift Control w/Steering Wheel Controls, Tracker System, Towing w/Trailer Sway Control, Tires: P235/60R18 All-Season Run-Flat, Tire Specific Low Tire Pressure Warning, Tailgate/Rear Door Lock Included w/Power Door Locks, Systems Monitor, Smart Device Integration, Side Impact Beams, Roof Rack Rails Only, Roll-Up Cargo Cover, Rocker Panel Extensions and Black Wheel Well Trim. *Stop By Today *You've earned this- stop by RBM of Atlanta located at 7640 Roswell Road, Atlanta, GA 30350 to make this car yours today! WHEELS: 18 5-SPOKE (R31) (STD), WHEEL LOCKS, TIRES: P235/55R19 ALL-SEASON RUN-FLAT, STATIC LED HEADLAMPS, SMARTPHONE INTEGRATION PACKAGE -inc: Android Auto, Apple CarPlay, Smartphone Integration, SADDLE BROWN/BLACK, LEATHER UPHOLSTERY, REAR SEAT ENTERTAINMENT & COMFORT ADAPTER, PREMIUM PACKAGE -inc: KEYLESS GO, SiriusXM Satellite Radio, POLAR WHITE, NATURAL GRAIN BLACK ASH WOOD/ALUMINUM DOOR TRIM -inc: Center console, Brushed. This Mercedes-Benz GLC has a dependable Intercooled Turbo Premium Unleaded I-4 2.0 L/121 engine powering this Automatic transmission. * Experience a Fully-Loaded Mercedes-Benz GLC GLC 300 *BLIND SPOT ASSIST, BLACK MB-TEX, MB-TEX UPHOLSTERY, BLACK FABRIC HEADLINER, Window Grid Antenna, Valet Function, Urethane Gear Shift Knob, Turn-By-Turn Navigation Directions, Trunk/Hatch Auto-Latch, Trip Computer, Transmission: 9G-TRONIC 9-Speed Automatic -inc: DYNAMIC SELECT, Transmission w/TouchShift Sequential Shift Control w/Steering Wheel Controls, Tracker System, Towing Equipment -inc: Trailer Sway Control, Tires: P235/60R18 All-Season Run-Flat, Tire Specific Low Tire Pressure Warning, Tailgate/Rear Door Lock Included w/Power Door Locks, Systems Monitor, Smart Device Integration, Side Impact Beams, Roof Rack Rails Only. 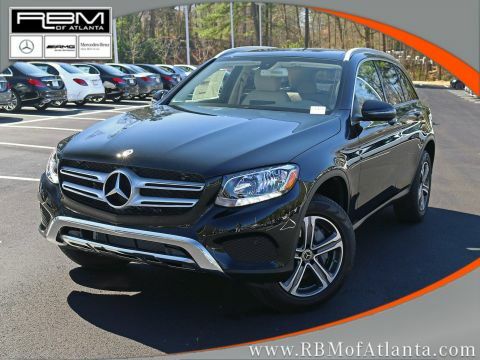 * Visit Us Today *A short visit to RBM of Atlanta located at 7640 Roswell Road, Atlanta, GA 30350 can get you a tried-and-true GLC today!WHEELS: 18 5-SPOKE (R31) (STD), WHEEL LOCKS, TIRES: P235/55R19 ALL-SEASON RUN-FLAT, STATIC LED HEADLAMPS, SMARTPHONE INTEGRATION PACKAGE -inc: Android Auto, Apple CarPlay, Smartphone Integration, SADDLE BROWN/BLACK, LEATHER UPHOLSTERY, REAR SEAT ENTERTAINMENT & COMFORT ADAPTER, PREMIUM PACKAGE -inc: KEYLESS GO, SiriusXM Satellite Radio, POLAR WHITE, NATURAL GRAIN BLACK ASH WOOD/ALUMINUM DOOR TRIM -inc: Center console, Brushed. This Mercedes-Benz GLC has a dependable Intercooled Turbo Premium Unleaded I-4 2.0 L/121 engine powering this Automatic transmission. * Experience a Fully-Loaded Mercedes-Benz GLC GLC 300 *BLIND SPOT ASSIST, BLACK MB-TEX, MB-TEX UPHOLSTERY, BLACK FABRIC HEADLINER, Window Grid Antenna, Valet Function, Urethane Gear Shift Knob, Turn-By-Turn Navigation Directions, Trunk/Hatch Auto-Latch, Trip Computer, Transmission: 9G-TRONIC 9-Speed Automatic -inc: DYNAMIC SELECT, Transmission w/TouchShift Sequential Shift Control w/Steering Wheel Controls, Tracker System, Towing Equipment -inc: Trailer Sway Control, Tires: P235/60R18 All-Season Run-Flat, Tire Specific Low Tire Pressure Warning, Tailgate/Rear Door Lock Included w/Power Door Locks, Systems Monitor, Smart Device Integration, Side Impact Beams, Roof Rack Rails Only. * Visit Us Today *A short visit to RBM of Atlanta located at 7640 Roswell Road, Atlanta, GA 30350 can get you a tried-and-true GLC today! WHEELS: 18 5-SPOKE (R31) (STD), WHEEL LOCKS, SMARTPHONE INTEGRATION PACKAGE -inc: Android Auto, Apple CarPlay, Smartphone Integration, SILK BEIGE/BLACK MB-TEX, MB-TEX UPHOLSTERY, SADDLE BROWN/BLACK, LEATHER UPHOLSTERY, REAR CHROME TRIM, PRE-WIRING FOR REAR SEAT ENT & COMFORT ADAPTER, PREMIUM PACKAGE -inc: KEYLESS GO, SiriusXM Satellite Radio, PORCELAIN FABRIC HEADLINER, HEATED FRONT SEATS. This Mercedes-Benz GLC has a strong Intercooled Turbo Premium Unleaded I-4 2.0 L/121 engine powering this Automatic transmission. *This Mercedes-Benz GLC GLC 300 Has Everything You Want *Window Grid Antenna, Wheels: 18 5-Spoke (R31), Valet Function, Urethane Gear Shift Knob, Turn-By-Turn Navigation Directions, Trunk/Hatch Auto-Latch, Trip Computer, Transmission: 9G-TRONIC 9-Speed Automatic -inc: DYNAMIC SELECT, Transmission w/TouchShift Sequential Shift Control w/Steering Wheel Controls, Tracker System, Towing Equipment -inc: Trailer Sway Control, Tires: P235/60R18 Run-Flat, Tire Specific Low Tire Pressure Warning, Tailgate/Rear Door Lock Included w/Power Door Locks, Systems Monitor, Smart Device Integration, Side Impact Beams, Roof Rack Rails Only, Roll-Up Cargo Cover, Rocker Panel Extensions and Black Wheel Well Trim. 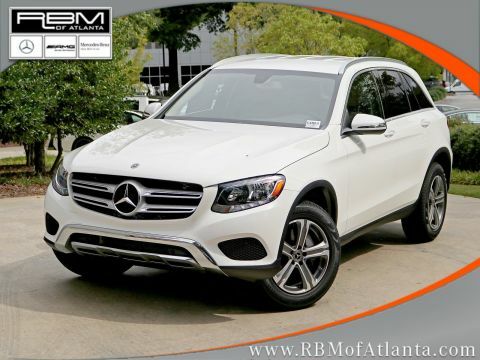 * Stop By Today *Come in for a quick visit at RBM of Atlanta, 7640 Roswell Road, Atlanta, GA 30350 to claim your Mercedes-Benz GLC!WHEELS: 18 5-SPOKE (R31) (STD), WHEEL LOCKS, SMARTPHONE INTEGRATION PACKAGE -inc: Android Auto, Apple CarPlay, Smartphone Integration, SILK BEIGE/BLACK MB-TEX, MB-TEX UPHOLSTERY, SADDLE BROWN/BLACK, LEATHER UPHOLSTERY, REAR CHROME TRIM, PRE-WIRING FOR REAR SEAT ENT & COMFORT ADAPTER, PREMIUM PACKAGE -inc: KEYLESS GO, SiriusXM Satellite Radio, PORCELAIN FABRIC HEADLINER, HEATED FRONT SEATS. This Mercedes-Benz GLC has a strong Intercooled Turbo Premium Unleaded I-4 2.0 L/121 engine powering this Automatic transmission. *This Mercedes-Benz GLC GLC 300 Has Everything You Want *Window Grid Antenna, Wheels: 18 5-Spoke (R31), Valet Function, Urethane Gear Shift Knob, Turn-By-Turn Navigation Directions, Trunk/Hatch Auto-Latch, Trip Computer, Transmission: 9G-TRONIC 9-Speed Automatic -inc: DYNAMIC SELECT, Transmission w/TouchShift Sequential Shift Control w/Steering Wheel Controls, Tracker System, Towing Equipment -inc: Trailer Sway Control, Tires: P235/60R18 Run-Flat, Tire Specific Low Tire Pressure Warning, Tailgate/Rear Door Lock Included w/Power Door Locks, Systems Monitor, Smart Device Integration, Side Impact Beams, Roof Rack Rails Only, Roll-Up Cargo Cover, Rocker Panel Extensions and Black Wheel Well Trim. 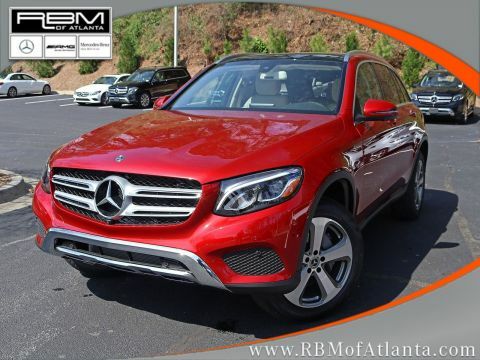 * Stop By Today *Come in for a quick visit at RBM of Atlanta, 7640 Roswell Road, Atlanta, GA 30350 to claim your Mercedes-Benz GLC! WHEELS: 19 AMG® TWIN 5-SPOKE W/GREY ACCENTS -inc: Tires: P235/55R19 All-Season Run-Flat, WHEEL LOCKS, TIRES: P235/55R19 ALL-SEASON RUN-FLAT, SMARTPHONE INTEGRATION PACKAGE -inc: Android Auto, Apple CarPlay, Smartphone Integration, SADDLE BROWN/BLACK, LEATHER UPHOLSTERY, REAR SEAT ENTERTAINMENT & COMFORT ADAPTER, REAR CHROME TRIM, PREMIUM PACKAGE -inc: KEYLESS GO, SiriusXM Satellite Radio, POLAR WHITE, NATURAL GRAIN BLACK ASH WOOD/ALUMINUM DOOR TRIM -inc: Center console, Brushed. This Mercedes-Benz GLC has a dependable Intercooled Turbo Premium Unleaded I-4 2.0 L/121 engine powering this Automatic transmission. * Experience a Fully-Loaded Mercedes-Benz GLC GLC 300 *BLIND SPOT ASSIST, BLACK MB-TEX, MB-TEX UPHOLSTERY, BLACK FABRIC HEADLINER, AMG® LINE -inc: flat-bottom multifunction sport steering wheel, front brakes w/perforated discs and Mercedes-Benz lettered brake calipers and brushed aluminum pedals w/rubber studs, AMG® Line Bodystyling, AMG® Line Exterior, AMG® Line Floor Mats, AMG® Line Interior, Window Grid Antenna, Valet Function, Urethane Gear Shift Knob, Turn-By-Turn Navigation Directions, Trunk/Hatch Auto-Latch, Trip Computer, Transmission: 9G-TRONIC 9-Speed Automatic -inc: DYNAMIC SELECT, Transmission w/TouchShift Sequential Shift Control w/Steering Wheel Controls, Tracker System, Towing Equipment -inc: Trailer Sway Control, Tires: P235/60R18 All-Season Run-Flat, Tire Specific Low Tire Pressure Warning, Tailgate/Rear Door Lock Included w/Power Door Locks, Systems Monitor, Smart Device Integration, Side Impact Beams. 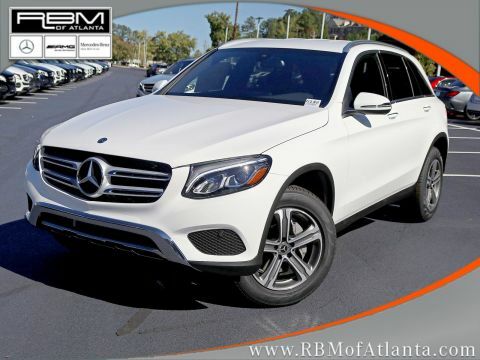 * Stop By Today *A short visit to RBM of Atlanta located at 7640 Roswell Road, Atlanta, GA 30350 can get you a dependable GLC today!WHEELS: 19 AMG® TWIN 5-SPOKE W/GREY ACCENTS -inc: Tires: P235/55R19 All-Season Run-Flat, WHEEL LOCKS, TIRES: P235/55R19 ALL-SEASON RUN-FLAT, SMARTPHONE INTEGRATION PACKAGE -inc: Android Auto, Apple CarPlay, Smartphone Integration, SADDLE BROWN/BLACK, LEATHER UPHOLSTERY, REAR SEAT ENTERTAINMENT & COMFORT ADAPTER, REAR CHROME TRIM, PREMIUM PACKAGE -inc: KEYLESS GO, SiriusXM Satellite Radio, POLAR WHITE, NATURAL GRAIN BLACK ASH WOOD/ALUMINUM DOOR TRIM -inc: Center console, Brushed. This Mercedes-Benz GLC has a dependable Intercooled Turbo Premium Unleaded I-4 2.0 L/121 engine powering this Automatic transmission. * Experience a Fully-Loaded Mercedes-Benz GLC GLC 300 *BLIND SPOT ASSIST, BLACK MB-TEX, MB-TEX UPHOLSTERY, BLACK FABRIC HEADLINER, AMG® LINE -inc: flat-bottom multifunction sport steering wheel, front brakes w/perforated discs and Mercedes-Benz lettered brake calipers and brushed aluminum pedals w/rubber studs, AMG® Line Bodystyling, AMG® Line Exterior, AMG® Line Floor Mats, AMG® Line Interior, Window Grid Antenna, Valet Function, Urethane Gear Shift Knob, Turn-By-Turn Navigation Directions, Trunk/Hatch Auto-Latch, Trip Computer, Transmission: 9G-TRONIC 9-Speed Automatic -inc: DYNAMIC SELECT, Transmission w/TouchShift Sequential Shift Control w/Steering Wheel Controls, Tracker System, Towing Equipment -inc: Trailer Sway Control, Tires: P235/60R18 All-Season Run-Flat, Tire Specific Low Tire Pressure Warning, Tailgate/Rear Door Lock Included w/Power Door Locks, Systems Monitor, Smart Device Integration, Side Impact Beams. * Stop By Today *A short visit to RBM of Atlanta located at 7640 Roswell Road, Atlanta, GA 30350 can get you a dependable GLC today! WHEELS: 19 5-SPOKE -inc: Tires: P235/55R19 All-Season Run-Flat, WHEEL LOCKS, TIRES: P235/55R19 ALL-SEASON RUN-FLAT, STATIC LED HEADLAMPS, SMARTPHONE INTEGRATION PACKAGE -inc: Android Auto, Apple CarPlay, Smartphone Integration, SADDLE BROWN/BLACK, LEATHER UPHOLSTERY, REAR SEAT ENTERTAINMENT & COMFORT ADAPTER, PANORAMA SUNROOF, IRIDIUM SILVER METALLIC, HEATED FRONT SEATS. This Mercedes-Benz GLC has a powerful Intercooled Turbo Premium Unleaded I-4 2.0 L/121 engine powering this Automatic transmission. *This Mercedes-Benz GLC GLC 300 Has Everything You Want *BLIND SPOT ASSIST, BLACK MB-TEX, MB-TEX UPHOLSTERY, BLACK FABRIC HEADLINER, Window Grid Antenna, Valet Function, Urethane Gear Shift Knob, Turn-By-Turn Navigation Directions, Trunk/Hatch Auto-Latch, Trip Computer, Transmission: 9G-TRONIC 9-Speed Automatic -inc: DYNAMIC SELECT, Transmission w/TouchShift Sequential Shift Control w/Steering Wheel Controls, Tracker System, Towing Equipment -inc: Trailer Sway Control, Tires: P235/60R18 All-Season Run-Flat, Tire Specific Low Tire Pressure Warning, Tailgate/Rear Door Lock Included w/Power Door Locks, Systems Monitor, Smart Device Integration, Side Impact Beams, Roof Rack Rails Only. * Stop By Today *Test drive this must-see, must-drive, must-own beauty today at RBM of Atlanta, 7640 Roswell Road, Atlanta, GA 30350.WHEELS: 19 5-SPOKE -inc: Tires: P235/55R19 All-Season Run-Flat, WHEEL LOCKS, TIRES: P235/55R19 ALL-SEASON RUN-FLAT, STATIC LED HEADLAMPS, SMARTPHONE INTEGRATION PACKAGE -inc: Android Auto, Apple CarPlay, Smartphone Integration, SADDLE BROWN/BLACK, LEATHER UPHOLSTERY, REAR SEAT ENTERTAINMENT & COMFORT ADAPTER, PANORAMA SUNROOF, IRIDIUM SILVER METALLIC, HEATED FRONT SEATS. This Mercedes-Benz GLC has a powerful Intercooled Turbo Premium Unleaded I-4 2.0 L/121 engine powering this Automatic transmission. *This Mercedes-Benz GLC GLC 300 Has Everything You Want *BLIND SPOT ASSIST, BLACK MB-TEX, MB-TEX UPHOLSTERY, BLACK FABRIC HEADLINER, Window Grid Antenna, Valet Function, Urethane Gear Shift Knob, Turn-By-Turn Navigation Directions, Trunk/Hatch Auto-Latch, Trip Computer, Transmission: 9G-TRONIC 9-Speed Automatic -inc: DYNAMIC SELECT, Transmission w/TouchShift Sequential Shift Control w/Steering Wheel Controls, Tracker System, Towing Equipment -inc: Trailer Sway Control, Tires: P235/60R18 All-Season Run-Flat, Tire Specific Low Tire Pressure Warning, Tailgate/Rear Door Lock Included w/Power Door Locks, Systems Monitor, Smart Device Integration, Side Impact Beams, Roof Rack Rails Only. * Stop By Today *Test drive this must-see, must-drive, must-own beauty today at RBM of Atlanta, 7640 Roswell Road, Atlanta, GA 30350. WHEELS: 19 5-SPOKE -inc: Tires: P235/55R19 Run-Flat, WHEEL LOCKS, STATIC LED HEADLAMPS, SMARTPHONE INTEGRATION PACKAGE -inc: Android Auto, Apple CarPlay, Smartphone Integration, SILK BEIGE/BLACK MB-TEX, MB-TEX UPHOLSTERY, REAR SEAT ENTERTAINMENT & COMFORT ADAPTER, PREMIUM PACKAGE -inc: KEYLESS GO, SiriusXM Satellite Radio, PORCELAIN FABRIC HEADLINER, PANORAMA SUNROOF, LED LOGO PROJECTORS. This Mercedes-Benz GLC has a strong Intercooled Turbo Premium Unleaded I-4 2.0 L/121 engine powering this Automatic transmission. *Experience a Fully-Loaded Mercedes-Benz GLC GLC 300 *DARK BROWN LINDEN WOOD TRIM, BLIND SPOT ASSIST, BLACK, AMBIENT LIGHTING (3 COLORS), Window Grid Antenna, Wheels: 18 5-Spoke (R31), Valet Function, Urethane Gear Shift Knob, Turn-By-Turn Navigation Directions, Trunk/Hatch Auto-Latch, Trip Computer, Transmission: 9G-TRONIC 9-Speed Automatic -inc: DYNAMIC SELECT, Transmission w/TouchShift Sequential Shift Control w/Steering Wheel Controls, Tracker System, Towing Equipment -inc: Trailer Sway Control, Tires: P235/60R18 Run-Flat, Tire Specific Low Tire Pressure Warning, Tailgate/Rear Door Lock Included w/Power Door Locks, Systems Monitor, Smart Device Integration. *Visit Us Today *Treat yourself- stop by RBM of Atlanta located at 7640 Roswell Road, Atlanta, GA 30350 to make this car yours today!WHEELS: 19 5-SPOKE -inc: Tires: P235/55R19 Run-Flat, WHEEL LOCKS, STATIC LED HEADLAMPS, SMARTPHONE INTEGRATION PACKAGE -inc: Android Auto, Apple CarPlay, Smartphone Integration, SILK BEIGE/BLACK MB-TEX, MB-TEX UPHOLSTERY, REAR SEAT ENTERTAINMENT & COMFORT ADAPTER, PREMIUM PACKAGE -inc: KEYLESS GO, SiriusXM Satellite Radio, PORCELAIN FABRIC HEADLINER, PANORAMA SUNROOF, LED LOGO PROJECTORS. This Mercedes-Benz GLC has a strong Intercooled Turbo Premium Unleaded I-4 2.0 L/121 engine powering this Automatic transmission. *Experience a Fully-Loaded Mercedes-Benz GLC GLC 300 *DARK BROWN LINDEN WOOD TRIM, BLIND SPOT ASSIST, BLACK, AMBIENT LIGHTING (3 COLORS), Window Grid Antenna, Wheels: 18 5-Spoke (R31), Valet Function, Urethane Gear Shift Knob, Turn-By-Turn Navigation Directions, Trunk/Hatch Auto-Latch, Trip Computer, Transmission: 9G-TRONIC 9-Speed Automatic -inc: DYNAMIC SELECT, Transmission w/TouchShift Sequential Shift Control w/Steering Wheel Controls, Tracker System, Towing Equipment -inc: Trailer Sway Control, Tires: P235/60R18 Run-Flat, Tire Specific Low Tire Pressure Warning, Tailgate/Rear Door Lock Included w/Power Door Locks, Systems Monitor, Smart Device Integration. *Visit Us Today *Treat yourself- stop by RBM of Atlanta located at 7640 Roswell Road, Atlanta, GA 30350 to make this car yours today! WHEELS: 18 5-SPOKE (R31) (STD), WHEEL LOCKS, SMARTPHONE INTEGRATION PACKAGE -inc: Android Auto, Apple CarPlay, Smartphone Integration, SILK BEIGE/BLACK MB-TEX, MB-TEX UPHOLSTERY, REAR CHROME TRIM, PRE-WIRING FOR REAR SEAT ENT & COMFORT ADAPTER, PREMIUM PACKAGE -inc: KEYLESS GO, SiriusXM Satellite Radio, PORCELAIN FABRIC HEADLINER, PANORAMA SUNROOF, HEATED STEERING WHEEL. This Mercedes-Benz GLC has a strong Intercooled Turbo Premium Unleaded I-4 2.0 L/121 engine powering this Automatic transmission. *These Packages Will Make Your Mercedes-Benz GLC GLC 300 The Envy of Your Friends *BLIND SPOT ASSIST, BLACK, Window Grid Antenna, Wheels: 18 5-Spoke (R31), Valet Function, Urethane Gear Shift Knob, Turn-By-Turn Navigation Directions, Trunk/Hatch Auto-Latch, Trip Computer, Transmission: 9G-TRONIC 9-Speed Automatic -inc: DYNAMIC SELECT, Transmission w/TouchShift Sequential Shift Control w/Steering Wheel Controls, Tracker System, Towing Equipment -inc: Trailer Sway Control, Tires: P235/60R18 Run-Flat, Tire Specific Low Tire Pressure Warning, Tailgate/Rear Door Lock Included w/Power Door Locks, Systems Monitor, Smart Device Integration, Side Impact Beams, Roof Rack Rails Only. 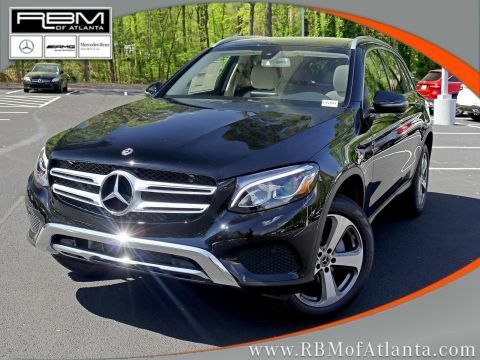 * Visit Us Today *For a must-own Mercedes-Benz GLC come see us at RBM of Atlanta, 7640 Roswell Road, Atlanta, GA 30350. Just minutes away!WHEELS: 18 5-SPOKE (R31) (STD), WHEEL LOCKS, SMARTPHONE INTEGRATION PACKAGE -inc: Android Auto, Apple CarPlay, Smartphone Integration, SILK BEIGE/BLACK MB-TEX, MB-TEX UPHOLSTERY, REAR CHROME TRIM, PRE-WIRING FOR REAR SEAT ENT & COMFORT ADAPTER, PREMIUM PACKAGE -inc: KEYLESS GO, SiriusXM Satellite Radio, PORCELAIN FABRIC HEADLINER, PANORAMA SUNROOF, HEATED STEERING WHEEL. This Mercedes-Benz GLC has a strong Intercooled Turbo Premium Unleaded I-4 2.0 L/121 engine powering this Automatic transmission. *These Packages Will Make Your Mercedes-Benz GLC GLC 300 The Envy of Your Friends *BLIND SPOT ASSIST, BLACK, Window Grid Antenna, Wheels: 18 5-Spoke (R31), Valet Function, Urethane Gear Shift Knob, Turn-By-Turn Navigation Directions, Trunk/Hatch Auto-Latch, Trip Computer, Transmission: 9G-TRONIC 9-Speed Automatic -inc: DYNAMIC SELECT, Transmission w/TouchShift Sequential Shift Control w/Steering Wheel Controls, Tracker System, Towing Equipment -inc: Trailer Sway Control, Tires: P235/60R18 Run-Flat, Tire Specific Low Tire Pressure Warning, Tailgate/Rear Door Lock Included w/Power Door Locks, Systems Monitor, Smart Device Integration, Side Impact Beams, Roof Rack Rails Only. 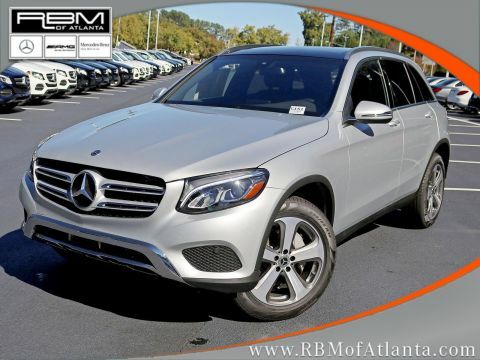 * Visit Us Today *For a must-own Mercedes-Benz GLC come see us at RBM of Atlanta, 7640 Roswell Road, Atlanta, GA 30350. Just minutes away! WHEELS: 19 5-SPOKE -inc: Tires: P235/55R19 Run-Flat, WHEEL LOCKS, STATIC LED HEADLAMPS, SMARTPHONE INTEGRATION PACKAGE -inc: Android Auto, Apple CarPlay, Smartphone Integration, SILK BEIGE/BLACK MB-TEX, MB-TEX UPHOLSTERY, SADDLE BROWN/BLACK, LEATHER UPHOLSTERY, PREMIUM PACKAGE -inc: KEYLESS GO, SiriusXM Satellite Radio, PORCELAIN FABRIC HEADLINER, PANORAMA SUNROOF, MOJAVE SILVER METALLIC. This Mercedes-Benz GLC has a strong Intercooled Turbo Premium Unleaded I-4 2.0 L/121 engine powering this Automatic transmission. *This Mercedes-Benz GLC GLC 300 Has Everything You Want *HEATED FRONT SEATS, DARK BROWN LINDEN WOOD TRIM, BLIND SPOT ASSIST, AMBIENT LIGHTING (3 COLORS), Window Grid Antenna, Wheels: 18 5-Spoke (R31), Valet Function, Urethane Gear Shift Knob, Turn-By-Turn Navigation Directions, Trunk/Hatch Auto-Latch, Trip Computer, Transmission: 9G-TRONIC 9-Speed Automatic -inc: DYNAMIC SELECT, Transmission w/TouchShift Sequential Shift Control w/Steering Wheel Controls, Tracker System, Towing Equipment -inc: Trailer Sway Control, Tires: P235/60R18 Run-Flat, Tire Specific Low Tire Pressure Warning, Tailgate/Rear Door Lock Included w/Power Door Locks, Systems Monitor, Smart Device Integration. 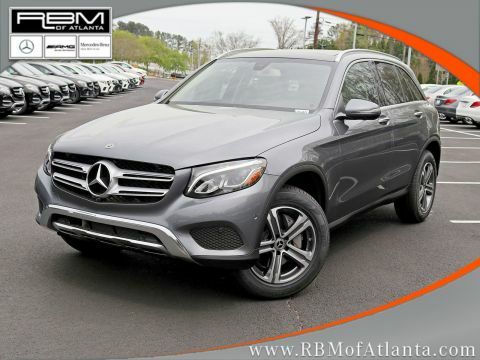 * Stop By Today *Come in for a quick visit at RBM of Atlanta, 7640 Roswell Road, Atlanta, GA 30350 to claim your Mercedes-Benz GLC!WHEELS: 19 5-SPOKE -inc: Tires: P235/55R19 Run-Flat, WHEEL LOCKS, STATIC LED HEADLAMPS, SMARTPHONE INTEGRATION PACKAGE -inc: Android Auto, Apple CarPlay, Smartphone Integration, SILK BEIGE/BLACK MB-TEX, MB-TEX UPHOLSTERY, SADDLE BROWN/BLACK, LEATHER UPHOLSTERY, PREMIUM PACKAGE -inc: KEYLESS GO, SiriusXM Satellite Radio, PORCELAIN FABRIC HEADLINER, PANORAMA SUNROOF, MOJAVE SILVER METALLIC. This Mercedes-Benz GLC has a strong Intercooled Turbo Premium Unleaded I-4 2.0 L/121 engine powering this Automatic transmission. *This Mercedes-Benz GLC GLC 300 Has Everything You Want *HEATED FRONT SEATS, DARK BROWN LINDEN WOOD TRIM, BLIND SPOT ASSIST, AMBIENT LIGHTING (3 COLORS), Window Grid Antenna, Wheels: 18 5-Spoke (R31), Valet Function, Urethane Gear Shift Knob, Turn-By-Turn Navigation Directions, Trunk/Hatch Auto-Latch, Trip Computer, Transmission: 9G-TRONIC 9-Speed Automatic -inc: DYNAMIC SELECT, Transmission w/TouchShift Sequential Shift Control w/Steering Wheel Controls, Tracker System, Towing Equipment -inc: Trailer Sway Control, Tires: P235/60R18 Run-Flat, Tire Specific Low Tire Pressure Warning, Tailgate/Rear Door Lock Included w/Power Door Locks, Systems Monitor, Smart Device Integration. 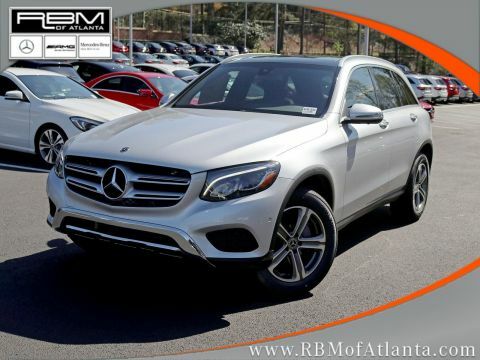 * Stop By Today *Come in for a quick visit at RBM of Atlanta, 7640 Roswell Road, Atlanta, GA 30350 to claim your Mercedes-Benz GLC! WHEELS: 19 5-SPOKE -inc: Tires: P235/55R19 Run-Flat, WHEEL LOCKS, STATIC LED HEADLAMPS, SMARTPHONE INTEGRATION PACKAGE -inc: Android Auto, Apple CarPlay, Smartphone Integration, SILK BEIGE/BLACK MB-TEX, MB-TEX UPHOLSTERY, SADDLE BROWN/BLACK, LEATHER UPHOLSTERY, REAR SEAT ENTERTAINMENT & COMFORT ADAPTER, REAR CHROME TRIM, PREMIUM PACKAGE -inc: KEYLESS GO, SiriusXM Satellite Radio, PORCELAIN FABRIC HEADLINER. This Mercedes-Benz GLC has a powerful Intercooled Turbo Premium Unleaded I-4 2.0 L/121 engine powering this Automatic transmission. * Experience a Fully-Loaded Mercedes-Benz GLC GLC 300 *NATURAL GRAIN BLACK ASH WOOD TRIM, LED LOGO PROJECTORS, ILLUMINATED STAR, ILLUMINATED DOOR SILLS, HEATED FRONT SEATS, BLIND SPOT ASSIST, BLACK, AMBIENT LIGHTING (3 COLORS), Window Grid Antenna, Wheels: 18 5-Spoke (R31), Valet Function, Urethane Gear Shift Knob, Turn-By-Turn Navigation Directions, Trunk/Hatch Auto-Latch, Trip Computer, Transmission: 9G-TRONIC 9-Speed Automatic -inc: DYNAMIC SELECT, Transmission w/TouchShift Sequential Shift Control w/Steering Wheel Controls, Tracker System, Towing Equipment -inc: Trailer Sway Control, Tires: P235/60R18 Run-Flat. * Visit Us Today *You've earned this- stop by RBM of Atlanta located at 7640 Roswell Road, Atlanta, GA 30350 to make this car yours today!WHEELS: 19 5-SPOKE -inc: Tires: P235/55R19 Run-Flat, WHEEL LOCKS, STATIC LED HEADLAMPS, SMARTPHONE INTEGRATION PACKAGE -inc: Android Auto, Apple CarPlay, Smartphone Integration, SILK BEIGE/BLACK MB-TEX, MB-TEX UPHOLSTERY, SADDLE BROWN/BLACK, LEATHER UPHOLSTERY, REAR SEAT ENTERTAINMENT & COMFORT ADAPTER, REAR CHROME TRIM, PREMIUM PACKAGE -inc: KEYLESS GO, SiriusXM Satellite Radio, PORCELAIN FABRIC HEADLINER. This Mercedes-Benz GLC has a powerful Intercooled Turbo Premium Unleaded I-4 2.0 L/121 engine powering this Automatic transmission. * Experience a Fully-Loaded Mercedes-Benz GLC GLC 300 *NATURAL GRAIN BLACK ASH WOOD TRIM, LED LOGO PROJECTORS, ILLUMINATED STAR, ILLUMINATED DOOR SILLS, HEATED FRONT SEATS, BLIND SPOT ASSIST, BLACK, AMBIENT LIGHTING (3 COLORS), Window Grid Antenna, Wheels: 18 5-Spoke (R31), Valet Function, Urethane Gear Shift Knob, Turn-By-Turn Navigation Directions, Trunk/Hatch Auto-Latch, Trip Computer, Transmission: 9G-TRONIC 9-Speed Automatic -inc: DYNAMIC SELECT, Transmission w/TouchShift Sequential Shift Control w/Steering Wheel Controls, Tracker System, Towing Equipment -inc: Trailer Sway Control, Tires: P235/60R18 Run-Flat. * Visit Us Today *You've earned this- stop by RBM of Atlanta located at 7640 Roswell Road, Atlanta, GA 30350 to make this car yours today! WHEELS: 18 5-SPOKE (R31) (STD), WHEEL LOCKS, STATIC LED HEADLAMPS, SMARTPHONE INTEGRATION PACKAGE -inc: Android Auto, Apple CarPlay, Smartphone Integration, SILK BEIGE/BLACK MB-TEX, MB-TEX UPHOLSTERY, SADDLE BROWN/BLACK, LEATHER UPHOLSTERY, REAR SEAT ENTERTAINMENT & COMFORT ADAPTER, PREMIUM PACKAGE -inc: KEYLESS GO, SiriusXM Satellite Radio, PORCELAIN FABRIC HEADLINER, PANORAMA SUNROOF. This Mercedes-Benz GLC has a dependable Intercooled Turbo Premium Unleaded I-4 2.0 L/121 engine powering this Automatic transmission. * Experience a Fully-Loaded Mercedes-Benz GLC GLC 300 *DESIGNO DIAMOND WHITE METALLIC, DARK BROWN LINDEN WOOD TRIM, BLIND SPOT ASSIST, Window Grid Antenna, Wheels: 18 5-Spoke (R31), Valet Function, Urethane Gear Shift Knob, Turn-By-Turn Navigation Directions, Trunk/Hatch Auto-Latch, Trip Computer, Transmission: 9G-TRONIC 9-Speed Automatic -inc: DYNAMIC SELECT, Transmission w/TouchShift Sequential Shift Control w/Steering Wheel Controls, Tracker System, Towing Equipment -inc: Trailer Sway Control, Tires: P235/60R18 Run-Flat, Tire Specific Low Tire Pressure Warning, Tailgate/Rear Door Lock Included w/Power Door Locks, Systems Monitor, Smart Device Integration, Side Impact Beams. * Stop By Today *Test drive this must-see, must-drive, must-own beauty today at RBM of Atlanta, 7640 Roswell Road, Atlanta, GA 30350.WHEELS: 18 5-SPOKE (R31) (STD), WHEEL LOCKS, STATIC LED HEADLAMPS, SMARTPHONE INTEGRATION PACKAGE -inc: Android Auto, Apple CarPlay, Smartphone Integration, SILK BEIGE/BLACK MB-TEX, MB-TEX UPHOLSTERY, SADDLE BROWN/BLACK, LEATHER UPHOLSTERY, REAR SEAT ENTERTAINMENT & COMFORT ADAPTER, PREMIUM PACKAGE -inc: KEYLESS GO, SiriusXM Satellite Radio, PORCELAIN FABRIC HEADLINER, PANORAMA SUNROOF. This Mercedes-Benz GLC has a dependable Intercooled Turbo Premium Unleaded I-4 2.0 L/121 engine powering this Automatic transmission. * Experience a Fully-Loaded Mercedes-Benz GLC GLC 300 *DESIGNO DIAMOND WHITE METALLIC, DARK BROWN LINDEN WOOD TRIM, BLIND SPOT ASSIST, Window Grid Antenna, Wheels: 18 5-Spoke (R31), Valet Function, Urethane Gear Shift Knob, Turn-By-Turn Navigation Directions, Trunk/Hatch Auto-Latch, Trip Computer, Transmission: 9G-TRONIC 9-Speed Automatic -inc: DYNAMIC SELECT, Transmission w/TouchShift Sequential Shift Control w/Steering Wheel Controls, Tracker System, Towing Equipment -inc: Trailer Sway Control, Tires: P235/60R18 Run-Flat, Tire Specific Low Tire Pressure Warning, Tailgate/Rear Door Lock Included w/Power Door Locks, Systems Monitor, Smart Device Integration, Side Impact Beams. * Stop By Today *Test drive this must-see, must-drive, must-own beauty today at RBM of Atlanta, 7640 Roswell Road, Atlanta, GA 30350. WHEELS: 19 5-SPOKE -inc: Tires: P235/55R19 Run-Flat, WHEEL LOCKS, STATIC LED HEADLAMPS, SMARTPHONE INTEGRATION PACKAGE -inc: Android Auto, Apple CarPlay, Smartphone Integration, SILK BEIGE/BLACK MB-TEX, MB-TEX UPHOLSTERY, REAR SEAT ENTERTAINMENT & COMFORT ADAPTER, PREMIUM PACKAGE -inc: KEYLESS GO, SiriusXM Satellite Radio, PORCELAIN FABRIC HEADLINER, PANORAMA SUNROOF, LED LOGO PROJECTORS. This Mercedes-Benz GLC has a dependable Intercooled Turbo Premium Unleaded I-4 2.0 L/121 engine powering this Automatic transmission. *Experience a Fully-Loaded Mercedes-Benz GLC GLC 300 *HEATED FRONT SEATS, DARK BROWN LINDEN WOOD TRIM, BLIND SPOT ASSIST, AMBIENT LIGHTING (3 COLORS), Window Grid Antenna, Wheels: 18 5-Spoke (R31), Valet Function, Urethane Gear Shift Knob, Turn-By-Turn Navigation Directions, Trunk/Hatch Auto-Latch, Trip Computer, Transmission: 9G-TRONIC 9-Speed Automatic -inc: DYNAMIC SELECT, Transmission w/TouchShift Sequential Shift Control w/Steering Wheel Controls, Tracker System, Towing Equipment -inc: Trailer Sway Control, Tires: P235/60R18 Run-Flat, Tire Specific Low Tire Pressure Warning, Tailgate/Rear Door Lock Included w/Power Door Locks, Systems Monitor, Smart Device Integration. *Visit Us Today *Test drive this must-see, must-drive, must-own beauty today at RBM of Atlanta, 7640 Roswell Road, Atlanta, GA 30350.WHEELS: 19 5-SPOKE -inc: Tires: P235/55R19 Run-Flat, WHEEL LOCKS, STATIC LED HEADLAMPS, SMARTPHONE INTEGRATION PACKAGE -inc: Android Auto, Apple CarPlay, Smartphone Integration, SILK BEIGE/BLACK MB-TEX, MB-TEX UPHOLSTERY, REAR SEAT ENTERTAINMENT & COMFORT ADAPTER, PREMIUM PACKAGE -inc: KEYLESS GO, SiriusXM Satellite Radio, PORCELAIN FABRIC HEADLINER, PANORAMA SUNROOF, LED LOGO PROJECTORS. This Mercedes-Benz GLC has a dependable Intercooled Turbo Premium Unleaded I-4 2.0 L/121 engine powering this Automatic transmission. *Experience a Fully-Loaded Mercedes-Benz GLC GLC 300 *HEATED FRONT SEATS, DARK BROWN LINDEN WOOD TRIM, BLIND SPOT ASSIST, AMBIENT LIGHTING (3 COLORS), Window Grid Antenna, Wheels: 18 5-Spoke (R31), Valet Function, Urethane Gear Shift Knob, Turn-By-Turn Navigation Directions, Trunk/Hatch Auto-Latch, Trip Computer, Transmission: 9G-TRONIC 9-Speed Automatic -inc: DYNAMIC SELECT, Transmission w/TouchShift Sequential Shift Control w/Steering Wheel Controls, Tracker System, Towing Equipment -inc: Trailer Sway Control, Tires: P235/60R18 Run-Flat, Tire Specific Low Tire Pressure Warning, Tailgate/Rear Door Lock Included w/Power Door Locks, Systems Monitor, Smart Device Integration. *Visit Us Today *Test drive this must-see, must-drive, must-own beauty today at RBM of Atlanta, 7640 Roswell Road, Atlanta, GA 30350. WHEELS: 19 5-SPOKE -inc: Tires: P235/55R19 Run-Flat, WHEEL LOCKS, STATIC LED HEADLAMPS, SMARTPHONE INTEGRATION PACKAGE -inc: Android Auto, Apple CarPlay, Smartphone Integration, SILK BEIGE/BLACK MB-TEX, MB-TEX UPHOLSTERY, SADDLE BROWN/BLACK, LEATHER UPHOLSTERY, REAR SEAT ENTERTAINMENT & COMFORT ADAPTER, PREMIUM PACKAGE -inc: KEYLESS GO, SiriusXM Satellite Radio, PORCELAIN FABRIC HEADLINER, POLAR WHITE. This Mercedes-Benz GLC has a dependable Intercooled Turbo Premium Unleaded I-4 2.0 L/121 engine powering this Automatic transmission. *This Mercedes-Benz GLC GLC 300 Has Everything You Want *PARKING ASSISTANCE PACKAGE -inc: HANDS-FREE Comfort Package, Parking Package, PARKTRONIC w/Active Parking Assist, Surround View Camera System, HANDS-FREE ACCESS , HEATED FRONT SEATS, DARK BROWN LINDEN WOOD TRIM, BLIND SPOT ASSIST, Window Grid Antenna, Wheels: 18 5-Spoke (R31), Valet Function, Urethane Gear Shift Knob, Turn-By-Turn Navigation Directions, Trunk/Hatch Auto-Latch, Trip Computer, Transmission: 9G-TRONIC 9-Speed Automatic -inc: DYNAMIC SELECT, Transmission w/TouchShift Sequential Shift Control w/Steering Wheel Controls, Tracker System, Towing Equipment -inc: Trailer Sway Control, Tires: P235/60R18 Run-Flat, Tire Specific Low Tire Pressure Warning, Tailgate/Rear Door Lock Included w/Power Door Locks, Systems Monitor, Smart Device Integration. * Stop By Today *Test drive this must-see, must-drive, must-own beauty today at RBM of Atlanta, 7640 Roswell Road, Atlanta, GA 30350.WHEELS: 19 5-SPOKE -inc: Tires: P235/55R19 Run-Flat, WHEEL LOCKS, STATIC LED HEADLAMPS, SMARTPHONE INTEGRATION PACKAGE -inc: Android Auto, Apple CarPlay, Smartphone Integration, SILK BEIGE/BLACK MB-TEX, MB-TEX UPHOLSTERY, SADDLE BROWN/BLACK, LEATHER UPHOLSTERY, REAR SEAT ENTERTAINMENT & COMFORT ADAPTER, PREMIUM PACKAGE -inc: KEYLESS GO, SiriusXM Satellite Radio, PORCELAIN FABRIC HEADLINER, POLAR WHITE. This Mercedes-Benz GLC has a dependable Intercooled Turbo Premium Unleaded I-4 2.0 L/121 engine powering this Automatic transmission. *This Mercedes-Benz GLC GLC 300 Has Everything You Want *PARKING ASSISTANCE PACKAGE -inc: HANDS-FREE Comfort Package, Parking Package, PARKTRONIC w/Active Parking Assist, Surround View Camera System, HANDS-FREE ACCESS , HEATED FRONT SEATS, DARK BROWN LINDEN WOOD TRIM, BLIND SPOT ASSIST, Window Grid Antenna, Wheels: 18 5-Spoke (R31), Valet Function, Urethane Gear Shift Knob, Turn-By-Turn Navigation Directions, Trunk/Hatch Auto-Latch, Trip Computer, Transmission: 9G-TRONIC 9-Speed Automatic -inc: DYNAMIC SELECT, Transmission w/TouchShift Sequential Shift Control w/Steering Wheel Controls, Tracker System, Towing Equipment -inc: Trailer Sway Control, Tires: P235/60R18 Run-Flat, Tire Specific Low Tire Pressure Warning, Tailgate/Rear Door Lock Included w/Power Door Locks, Systems Monitor, Smart Device Integration. * Stop By Today *Test drive this must-see, must-drive, must-own beauty today at RBM of Atlanta, 7640 Roswell Road, Atlanta, GA 30350. WHEELS: 18 5-SPOKE (R31) (STD), WHEEL LOCKS, STATIC LED HEADLAMPS, SMARTPHONE INTEGRATION PACKAGE -inc: Android Auto, Apple CarPlay, Smartphone Integration, SILK BEIGE/BLACK MB-TEX, MB-TEX UPHOLSTERY, SADDLE BROWN/BLACK, LEATHER UPHOLSTERY, REAR SEAT ENTERTAINMENT & COMFORT ADAPTER, PREMIUM PACKAGE -inc: KEYLESS GO, SiriusXM Satellite Radio, PORCELAIN FABRIC HEADLINER, PARKING ASSISTANCE PACKAGE -inc: HANDS-FREE Comfort Package, Parking Package, PARKTRONIC w/Active Parking Assist, Surround View Camera System, HANDS-FREE ACCESS. This Mercedes-Benz GLC has a dependable Intercooled Turbo Premium Unleaded I-4 2.0 L/121 engine powering this Automatic transmission. *These Packages Will Make Your Mercedes-Benz GLC GLC 300 The Envy of Your Friends *LED LOGO PROJECTORS, HEATED FRONT SEATS, BLIND SPOT ASSIST, Window Grid Antenna, Wheels: 18 5-Spoke (R31), Valet Function, Urethane Gear Shift Knob, Turn-By-Turn Navigation Directions, Trunk/Hatch Auto-Latch, Trip Computer, Transmission: 9G-TRONIC 9-Speed Automatic -inc: DYNAMIC SELECT, Transmission w/TouchShift Sequential Shift Control w/Steering Wheel Controls, Tracker System, Towing Equipment -inc: Trailer Sway Control, Tires: P235/60R18 Run-Flat, Tire Specific Low Tire Pressure Warning, Tailgate/Rear Door Lock Included w/Power Door Locks, Systems Monitor, Smart Device Integration, Side Impact Beams. * Visit Us Today *Live a little- stop by RBM of Atlanta located at 7640 Roswell Road, Atlanta, GA 30350 to make this car yours today!WHEELS: 18 5-SPOKE (R31) (STD), WHEEL LOCKS, STATIC LED HEADLAMPS, SMARTPHONE INTEGRATION PACKAGE -inc: Android Auto, Apple CarPlay, Smartphone Integration, SILK BEIGE/BLACK MB-TEX, MB-TEX UPHOLSTERY, SADDLE BROWN/BLACK, LEATHER UPHOLSTERY, REAR SEAT ENTERTAINMENT & COMFORT ADAPTER, PREMIUM PACKAGE -inc: KEYLESS GO, SiriusXM Satellite Radio, PORCELAIN FABRIC HEADLINER, PARKING ASSISTANCE PACKAGE -inc: HANDS-FREE Comfort Package, Parking Package, PARKTRONIC w/Active Parking Assist, Surround View Camera System, HANDS-FREE ACCESS. This Mercedes-Benz GLC has a dependable Intercooled Turbo Premium Unleaded I-4 2.0 L/121 engine powering this Automatic transmission. *These Packages Will Make Your Mercedes-Benz GLC GLC 300 The Envy of Your Friends *LED LOGO PROJECTORS, HEATED FRONT SEATS, BLIND SPOT ASSIST, Window Grid Antenna, Wheels: 18 5-Spoke (R31), Valet Function, Urethane Gear Shift Knob, Turn-By-Turn Navigation Directions, Trunk/Hatch Auto-Latch, Trip Computer, Transmission: 9G-TRONIC 9-Speed Automatic -inc: DYNAMIC SELECT, Transmission w/TouchShift Sequential Shift Control w/Steering Wheel Controls, Tracker System, Towing Equipment -inc: Trailer Sway Control, Tires: P235/60R18 Run-Flat, Tire Specific Low Tire Pressure Warning, Tailgate/Rear Door Lock Included w/Power Door Locks, Systems Monitor, Smart Device Integration, Side Impact Beams. * Visit Us Today *Live a little- stop by RBM of Atlanta located at 7640 Roswell Road, Atlanta, GA 30350 to make this car yours today! WHEELS: 18 5-SPOKE (R31) (STD), WHEEL LOCKS, STATIC LED HEADLAMPS, SMARTPHONE INTEGRATION PACKAGE -inc: Android Auto, Apple CarPlay, Smartphone Integration, REAR SEAT ENTERTAINMENT & COMFORT ADAPTER, PREMIUM PACKAGE -inc: KEYLESS GO, SiriusXM Satellite Radio, PARKING ASSISTANCE PACKAGE -inc: HANDS-FREE Comfort Package, Parking Package, PARKTRONIC w/Active Parking Assist, Surround View Camera System, HANDS-FREE ACCESS, PANORAMA SUNROOF, LED LOGO PROJECTORS, HEATED FRONT SEATS. This Mercedes-Benz GLC has a dependable Intercooled Turbo Premium Unleaded I-4 2.0 L/121 engine powering this Automatic transmission. *These Packages Will Make Your Mercedes-Benz GLC GLC 300 The Envy of Your Friends *BLACK MB-TEX, MB-TEX UPHOLSTERY, BLACK FABRIC HEADLINER, BLACK, Window Grid Antenna, Wheels: 18 5-Spoke (R31), Valet Function, Urethane Gear Shift Knob, Turn-By-Turn Navigation Directions, Trunk/Hatch Auto-Latch, Trip Computer, Transmission: 9G-TRONIC 9-Speed Automatic -inc: DYNAMIC SELECT, Transmission w/TouchShift Sequential Shift Control w/Steering Wheel Controls, Tracker System, Towing Equipment -inc: Trailer Sway Control, Tires: P235/60R18 Run-Flat, Tire Specific Low Tire Pressure Warning, Tailgate/Rear Door Lock Included w/Power Door Locks, Systems Monitor, Smart Device Integration, Side Impact Beams. *Stop By Today *Test drive this must-see, must-drive, must-own beauty today at RBM of Atlanta, 7640 Roswell Road, Atlanta, GA 30350.WHEELS: 18 5-SPOKE (R31) (STD), WHEEL LOCKS, STATIC LED HEADLAMPS, SMARTPHONE INTEGRATION PACKAGE -inc: Android Auto, Apple CarPlay, Smartphone Integration, REAR SEAT ENTERTAINMENT & COMFORT ADAPTER, PREMIUM PACKAGE -inc: KEYLESS GO, SiriusXM Satellite Radio, PARKING ASSISTANCE PACKAGE -inc: HANDS-FREE Comfort Package, Parking Package, PARKTRONIC w/Active Parking Assist, Surround View Camera System, HANDS-FREE ACCESS, PANORAMA SUNROOF, LED LOGO PROJECTORS, HEATED FRONT SEATS. This Mercedes-Benz GLC has a dependable Intercooled Turbo Premium Unleaded I-4 2.0 L/121 engine powering this Automatic transmission. *These Packages Will Make Your Mercedes-Benz GLC GLC 300 The Envy of Your Friends *BLACK MB-TEX, MB-TEX UPHOLSTERY, BLACK FABRIC HEADLINER, BLACK, Window Grid Antenna, Wheels: 18 5-Spoke (R31), Valet Function, Urethane Gear Shift Knob, Turn-By-Turn Navigation Directions, Trunk/Hatch Auto-Latch, Trip Computer, Transmission: 9G-TRONIC 9-Speed Automatic -inc: DYNAMIC SELECT, Transmission w/TouchShift Sequential Shift Control w/Steering Wheel Controls, Tracker System, Towing Equipment -inc: Trailer Sway Control, Tires: P235/60R18 Run-Flat, Tire Specific Low Tire Pressure Warning, Tailgate/Rear Door Lock Included w/Power Door Locks, Systems Monitor, Smart Device Integration, Side Impact Beams. *Stop By Today *Test drive this must-see, must-drive, must-own beauty today at RBM of Atlanta, 7640 Roswell Road, Atlanta, GA 30350. WHEELS: 18 5-SPOKE (R31) (STD), WHEEL LOCKS, STATIC LED HEADLAMPS, SMARTPHONE INTEGRATION PACKAGE -inc: Android Auto, Apple CarPlay, Smartphone Integration, SILK BEIGE/BLACK MB-TEX, MB-TEX UPHOLSTERY, SELENITE GREY METALLIC, REAR SEAT ENTERTAINMENT & COMFORT ADAPTER, PREMIUM PACKAGE -inc: KEYLESS GO, SiriusXM Satellite Radio, PORCELAIN FABRIC HEADLINER, PARKING ASSISTANCE PACKAGE -inc: HANDS-FREE Comfort Package, Parking Package, PARKTRONIC w/Active Parking Assist, Surround View Camera System, HANDS-FREE ACCESS. This Mercedes-Benz GLC has a dependable Intercooled Turbo Premium Unleaded I-4 2.0 L/121 engine powering this Automatic transmission. *Experience a Fully-Loaded Mercedes-Benz GLC GLC 300 *DARK BROWN LINDEN WOOD TRIM, BURMESTER SURROUND SOUND SYSTEM, BLIND SPOT ASSIST, Window Grid Antenna, Wheels: 18 5-Spoke (R31), Valet Function, Urethane Gear Shift Knob, Turn-By-Turn Navigation Directions, Trunk/Hatch Auto-Latch, Trip Computer, Transmission: 9G-TRONIC 9-Speed Automatic -inc: DYNAMIC SELECT, Transmission w/TouchShift Sequential Shift Control w/Steering Wheel Controls, Tracker System, Towing Equipment -inc: Trailer Sway Control, Tires: P235/60R18 Run-Flat, Tire Specific Low Tire Pressure Warning, Tailgate/Rear Door Lock Included w/Power Door Locks, Systems Monitor, Smart Device Integration, Side Impact Beams. 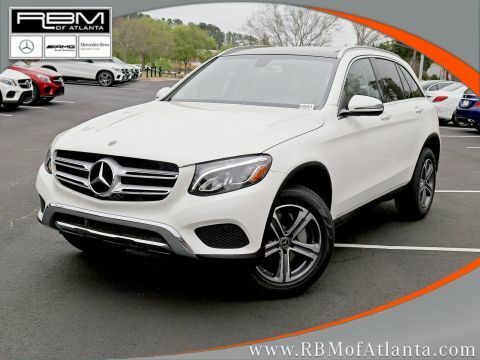 *Visit Us Today *Come in for a quick visit at RBM of Atlanta, 7640 Roswell Road, Atlanta, GA 30350 to claim your Mercedes-Benz GLC!WHEELS: 18 5-SPOKE (R31) (STD), WHEEL LOCKS, STATIC LED HEADLAMPS, SMARTPHONE INTEGRATION PACKAGE -inc: Android Auto, Apple CarPlay, Smartphone Integration, SILK BEIGE/BLACK MB-TEX, MB-TEX UPHOLSTERY, SELENITE GREY METALLIC, REAR SEAT ENTERTAINMENT & COMFORT ADAPTER, PREMIUM PACKAGE -inc: KEYLESS GO, SiriusXM Satellite Radio, PORCELAIN FABRIC HEADLINER, PARKING ASSISTANCE PACKAGE -inc: HANDS-FREE Comfort Package, Parking Package, PARKTRONIC w/Active Parking Assist, Surround View Camera System, HANDS-FREE ACCESS. This Mercedes-Benz GLC has a dependable Intercooled Turbo Premium Unleaded I-4 2.0 L/121 engine powering this Automatic transmission. *Experience a Fully-Loaded Mercedes-Benz GLC GLC 300 *DARK BROWN LINDEN WOOD TRIM, BURMESTER SURROUND SOUND SYSTEM, BLIND SPOT ASSIST, Window Grid Antenna, Wheels: 18 5-Spoke (R31), Valet Function, Urethane Gear Shift Knob, Turn-By-Turn Navigation Directions, Trunk/Hatch Auto-Latch, Trip Computer, Transmission: 9G-TRONIC 9-Speed Automatic -inc: DYNAMIC SELECT, Transmission w/TouchShift Sequential Shift Control w/Steering Wheel Controls, Tracker System, Towing Equipment -inc: Trailer Sway Control, Tires: P235/60R18 Run-Flat, Tire Specific Low Tire Pressure Warning, Tailgate/Rear Door Lock Included w/Power Door Locks, Systems Monitor, Smart Device Integration, Side Impact Beams. 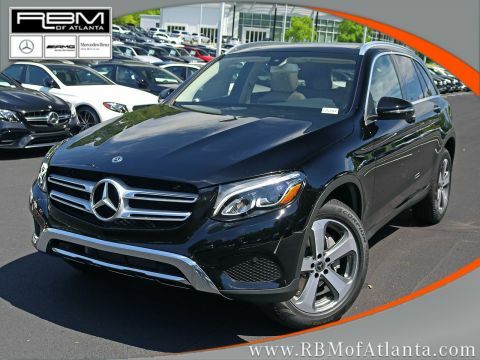 *Visit Us Today *Come in for a quick visit at RBM of Atlanta, 7640 Roswell Road, Atlanta, GA 30350 to claim your Mercedes-Benz GLC! WHEELS: 18 5-SPOKE (R31) (STD), WHEEL LOCKS, STATIC LED HEADLAMPS, SMARTPHONE INTEGRATION PACKAGE -inc: Android Auto, Apple CarPlay, Smartphone Integration, SILK BEIGE/BLACK MB-TEX, MB-TEX UPHOLSTERY, SELENITE GREY METALLIC, REAR SEAT ENTERTAINMENT & COMFORT ADAPTER, PREMIUM PACKAGE -inc: KEYLESS GO, SiriusXM Satellite Radio, PORCELAIN FABRIC HEADLINER, PARKING ASSISTANCE PACKAGE -inc: HANDS-FREE Comfort Package, Parking Package, PARKTRONIC w/Active Parking Assist, Surround View Camera System, HANDS-FREE ACCESS. This Mercedes-Benz GLC has a dependable Intercooled Turbo Premium Unleaded I-4 2.0 L/121 engine powering this Automatic transmission. *This Mercedes-Benz GLC GLC 300 Has Everything You Want *DARK BROWN LINDEN WOOD TRIM, BURMESTER SURROUND SOUND SYSTEM, BLIND SPOT ASSIST, Window Grid Antenna, Wheels: 18 5-Spoke (R31), Valet Function, Urethane Gear Shift Knob, Turn-By-Turn Navigation Directions, Trunk/Hatch Auto-Latch, Trip Computer, Transmission: 9G-TRONIC 9-Speed Automatic -inc: DYNAMIC SELECT, Transmission w/TouchShift Sequential Shift Control w/Steering Wheel Controls, Tracker System, Towing Equipment -inc: Trailer Sway Control, Tires: P235/60R18 Run-Flat, Tire Specific Low Tire Pressure Warning, Tailgate/Rear Door Lock Included w/Power Door Locks, Systems Monitor, Smart Device Integration, Side Impact Beams. *Stop By Today *Stop by RBM of Atlanta located at 7640 Roswell Road, Atlanta, GA 30350 for a quick visit and a great vehicle!WHEELS: 18 5-SPOKE (R31) (STD), WHEEL LOCKS, STATIC LED HEADLAMPS, SMARTPHONE INTEGRATION PACKAGE -inc: Android Auto, Apple CarPlay, Smartphone Integration, SILK BEIGE/BLACK MB-TEX, MB-TEX UPHOLSTERY, SELENITE GREY METALLIC, REAR SEAT ENTERTAINMENT & COMFORT ADAPTER, PREMIUM PACKAGE -inc: KEYLESS GO, SiriusXM Satellite Radio, PORCELAIN FABRIC HEADLINER, PARKING ASSISTANCE PACKAGE -inc: HANDS-FREE Comfort Package, Parking Package, PARKTRONIC w/Active Parking Assist, Surround View Camera System, HANDS-FREE ACCESS. This Mercedes-Benz GLC has a dependable Intercooled Turbo Premium Unleaded I-4 2.0 L/121 engine powering this Automatic transmission. *This Mercedes-Benz GLC GLC 300 Has Everything You Want *DARK BROWN LINDEN WOOD TRIM, BURMESTER SURROUND SOUND SYSTEM, BLIND SPOT ASSIST, Window Grid Antenna, Wheels: 18 5-Spoke (R31), Valet Function, Urethane Gear Shift Knob, Turn-By-Turn Navigation Directions, Trunk/Hatch Auto-Latch, Trip Computer, Transmission: 9G-TRONIC 9-Speed Automatic -inc: DYNAMIC SELECT, Transmission w/TouchShift Sequential Shift Control w/Steering Wheel Controls, Tracker System, Towing Equipment -inc: Trailer Sway Control, Tires: P235/60R18 Run-Flat, Tire Specific Low Tire Pressure Warning, Tailgate/Rear Door Lock Included w/Power Door Locks, Systems Monitor, Smart Device Integration, Side Impact Beams. *Stop By Today *Stop by RBM of Atlanta located at 7640 Roswell Road, Atlanta, GA 30350 for a quick visit and a great vehicle! WHEELS: 18 5-SPOKE (R31) (STD), STATIC LED HEADLAMPS, SMARTPHONE INTEGRATION PACKAGE -inc: Android Auto, Apple CarPlay, Smartphone Integration, SILK BEIGE/BLACK MB-TEX, MB-TEX UPHOLSTERY, REAR SEAT ENTERTAINMENT & COMFORT ADAPTER, REAR CHROME TRIM, PREMIUM PACKAGE -inc: KEYLESS GO, SiriusXM Satellite Radio, PORCELAIN FABRIC HEADLINER, POLAR WHITE, PANORAMA SUNROOF. This Mercedes-Benz GLC has a dependable Intercooled Turbo Premium Unleaded I-4 2.0 L/121 engine powering this Automatic transmission. *This Mercedes-Benz GLC GLC 300 Has Everything You Want *DARK BROWN LINDEN WOOD TRIM, CHROME DOOR HANDLE INSERTS, BURMESTER SURROUND SOUND SYSTEM, BLIND SPOT ASSIST, Window Grid Antenna, Wheels: 18 5-Spoke (R31), Valet Function, Urethane Gear Shift Knob, Turn-By-Turn Navigation Directions, Trunk/Hatch Auto-Latch, Trip Computer, Transmission: 9G-TRONIC 9-Speed Automatic -inc: DYNAMIC SELECT, Transmission w/TouchShift Sequential Shift Control w/Steering Wheel Controls, Tracker System, Towing Equipment -inc: Trailer Sway Control, Tires: P235/60R18 Run-Flat, Tire Specific Low Tire Pressure Warning, Tailgate/Rear Door Lock Included w/Power Door Locks, Systems Monitor, Smart Device Integration. 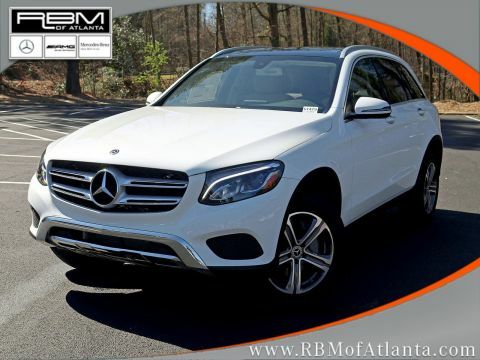 * Visit Us Today *For a must-own Mercedes-Benz GLC come see us at RBM of Atlanta, 7640 Roswell Road, Atlanta, GA 30350. Just minutes away!WHEELS: 18 5-SPOKE (R31) (STD), STATIC LED HEADLAMPS, SMARTPHONE INTEGRATION PACKAGE -inc: Android Auto, Apple CarPlay, Smartphone Integration, SILK BEIGE/BLACK MB-TEX, MB-TEX UPHOLSTERY, REAR SEAT ENTERTAINMENT & COMFORT ADAPTER, REAR CHROME TRIM, PREMIUM PACKAGE -inc: KEYLESS GO, SiriusXM Satellite Radio, PORCELAIN FABRIC HEADLINER, POLAR WHITE, PANORAMA SUNROOF. This Mercedes-Benz GLC has a dependable Intercooled Turbo Premium Unleaded I-4 2.0 L/121 engine powering this Automatic transmission. *This Mercedes-Benz GLC GLC 300 Has Everything You Want *DARK BROWN LINDEN WOOD TRIM, CHROME DOOR HANDLE INSERTS, BURMESTER SURROUND SOUND SYSTEM, BLIND SPOT ASSIST, Window Grid Antenna, Wheels: 18 5-Spoke (R31), Valet Function, Urethane Gear Shift Knob, Turn-By-Turn Navigation Directions, Trunk/Hatch Auto-Latch, Trip Computer, Transmission: 9G-TRONIC 9-Speed Automatic -inc: DYNAMIC SELECT, Transmission w/TouchShift Sequential Shift Control w/Steering Wheel Controls, Tracker System, Towing Equipment -inc: Trailer Sway Control, Tires: P235/60R18 Run-Flat, Tire Specific Low Tire Pressure Warning, Tailgate/Rear Door Lock Included w/Power Door Locks, Systems Monitor, Smart Device Integration. 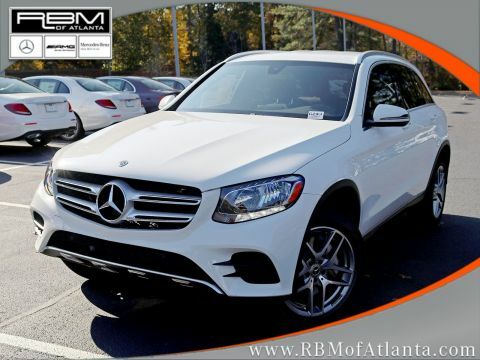 * Visit Us Today *For a must-own Mercedes-Benz GLC come see us at RBM of Atlanta, 7640 Roswell Road, Atlanta, GA 30350. Just minutes away! WHEEL LOCKS, STATIC LED HEADLAMPS, SMARTPHONE INTEGRATION PACKAGE -inc: Android Auto, Apple CarPlay, Smartphone Integration, REAR SEAT ENTERTAINMENT & COMFORT ADAPTER, PREMIUM PACKAGE -inc: KEYLESS GO, SiriusXM Satellite Radio, PARKING ASSISTANCE PACKAGE -inc: HANDS-FREE Comfort Package, Parking Package, PARKTRONIC w/Active Parking Assist, Surround View Camera System, HANDS-FREE ACCESS, PANORAMA SUNROOF, NATURAL GRAIN BLACK ASH WOOD/ALUMINUM DOOR TRIM -inc: Center console, Brushed, NATURAL GRAIN BLACK ASH WOOD TRIM, LED LOGO PROJECTORS. This Mercedes-Benz GLC has a dependable Intercooled Turbo Premium Unleaded I-4 2.0 L/121 engine powering this Automatic transmission. *Experience a Fully-Loaded Mercedes-Benz GLC GLC 300 *BURMESTER SURROUND SOUND SYSTEM, BLIND SPOT ASSIST, BLACK MB-TEX, MB-TEX UPHOLSTERY, BLACK FABRIC HEADLINER, AMBIENT LIGHTING (3 COLORS), Window Grid Antenna, Wheels: 18 5-Spoke (R31), Valet Function, Urethane Gear Shift Knob, Turn-By-Turn Navigation Directions, Trunk/Hatch Auto-Latch, Trip Computer, Transmission: 9G-TRONIC 9-Speed Automatic -inc: DYNAMIC SELECT, Transmission w/TouchShift Sequential Shift Control w/Steering Wheel Controls, Tracker System, Towing Equipment -inc: Trailer Sway Control, Tires: P235/60R18 Run-Flat, Tire Specific Low Tire Pressure Warning, Tailgate/Rear Door Lock Included w/Power Door Locks, Systems Monitor. 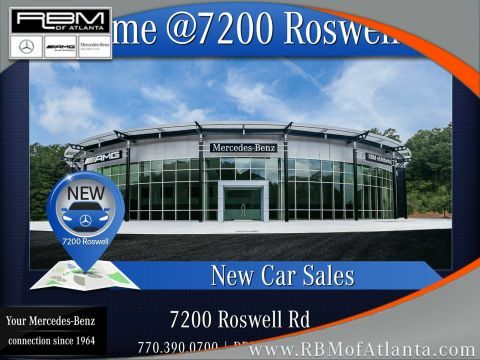 *Visit Us Today *Come in for a quick visit at RBM of Atlanta, 7640 Roswell Road, Atlanta, GA 30350 to claim your Mercedes-Benz GLC!WHEEL LOCKS, STATIC LED HEADLAMPS, SMARTPHONE INTEGRATION PACKAGE -inc: Android Auto, Apple CarPlay, Smartphone Integration, REAR SEAT ENTERTAINMENT & COMFORT ADAPTER, PREMIUM PACKAGE -inc: KEYLESS GO, SiriusXM Satellite Radio, PARKING ASSISTANCE PACKAGE -inc: HANDS-FREE Comfort Package, Parking Package, PARKTRONIC w/Active Parking Assist, Surround View Camera System, HANDS-FREE ACCESS, PANORAMA SUNROOF, NATURAL GRAIN BLACK ASH WOOD/ALUMINUM DOOR TRIM -inc: Center console, Brushed, NATURAL GRAIN BLACK ASH WOOD TRIM, LED LOGO PROJECTORS. This Mercedes-Benz GLC has a dependable Intercooled Turbo Premium Unleaded I-4 2.0 L/121 engine powering this Automatic transmission. *Experience a Fully-Loaded Mercedes-Benz GLC GLC 300 *BURMESTER SURROUND SOUND SYSTEM, BLIND SPOT ASSIST, BLACK MB-TEX, MB-TEX UPHOLSTERY, BLACK FABRIC HEADLINER, AMBIENT LIGHTING (3 COLORS), Window Grid Antenna, Wheels: 18 5-Spoke (R31), Valet Function, Urethane Gear Shift Knob, Turn-By-Turn Navigation Directions, Trunk/Hatch Auto-Latch, Trip Computer, Transmission: 9G-TRONIC 9-Speed Automatic -inc: DYNAMIC SELECT, Transmission w/TouchShift Sequential Shift Control w/Steering Wheel Controls, Tracker System, Towing Equipment -inc: Trailer Sway Control, Tires: P235/60R18 Run-Flat, Tire Specific Low Tire Pressure Warning, Tailgate/Rear Door Lock Included w/Power Door Locks, Systems Monitor. *Visit Us Today *Come in for a quick visit at RBM of Atlanta, 7640 Roswell Road, Atlanta, GA 30350 to claim your Mercedes-Benz GLC! WHEELS: 19 5-SPOKE -inc: Tires: P235/55R19 Run-Flat, WHEEL LOCKS, STATIC LED HEADLAMPS, SMARTPHONE INTEGRATION PACKAGE -inc: Android Auto, Apple CarPlay, Smartphone Integration, SILK BEIGE/BLACK MB-TEX, MB-TEX UPHOLSTERY, REAR SEAT ENTERTAINMENT & COMFORT ADAPTER, PREMIUM PACKAGE -inc: KEYLESS GO, SiriusXM Satellite Radio, PORCELAIN FABRIC HEADLINER, PARKING ASSISTANCE PACKAGE -inc: HANDS-FREE Comfort Package, Parking Package, PARKTRONIC w/Active Parking Assist, Surround View Camera System, HANDS-FREE ACCESS, PANORAMA SUNROOF. This Mercedes-Benz GLC has a strong Intercooled Turbo Premium Unleaded I-4 2.0 L/121 engine powering this Automatic transmission. *These Packages Will Make Your Mercedes-Benz GLC GLC 300 The Envy of Your Friends *DESIGNO CARDINAL RED METALLIC, DARK BROWN LINDEN WOOD TRIM, BLIND SPOT ASSIST, AMBIENT LIGHTING (3 COLORS), Window Grid Antenna, Wheels: 18 5-Spoke (R31), Valet Function, Urethane Gear Shift Knob, Turn-By-Turn Navigation Directions, Trunk/Hatch Auto-Latch, Trip Computer, Transmission: 9G-TRONIC 9-Speed Automatic -inc: DYNAMIC SELECT, Transmission w/TouchShift Sequential Shift Control w/Steering Wheel Controls, Tracker System, Towing Equipment -inc: Trailer Sway Control, Tires: P235/60R18 Run-Flat, Tire Specific Low Tire Pressure Warning, Tailgate/Rear Door Lock Included w/Power Door Locks, Systems Monitor, Smart Device Integration. 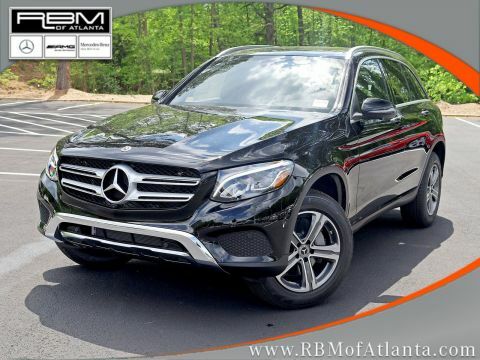 *Stop By Today *Come in for a quick visit at RBM of Atlanta, 7640 Roswell Road, Atlanta, GA 30350 to claim your Mercedes-Benz GLC!WHEELS: 19 5-SPOKE -inc: Tires: P235/55R19 Run-Flat, WHEEL LOCKS, STATIC LED HEADLAMPS, SMARTPHONE INTEGRATION PACKAGE -inc: Android Auto, Apple CarPlay, Smartphone Integration, SILK BEIGE/BLACK MB-TEX, MB-TEX UPHOLSTERY, REAR SEAT ENTERTAINMENT & COMFORT ADAPTER, PREMIUM PACKAGE -inc: KEYLESS GO, SiriusXM Satellite Radio, PORCELAIN FABRIC HEADLINER, PARKING ASSISTANCE PACKAGE -inc: HANDS-FREE Comfort Package, Parking Package, PARKTRONIC w/Active Parking Assist, Surround View Camera System, HANDS-FREE ACCESS, PANORAMA SUNROOF. This Mercedes-Benz GLC has a strong Intercooled Turbo Premium Unleaded I-4 2.0 L/121 engine powering this Automatic transmission. *These Packages Will Make Your Mercedes-Benz GLC GLC 300 The Envy of Your Friends *DESIGNO CARDINAL RED METALLIC, DARK BROWN LINDEN WOOD TRIM, BLIND SPOT ASSIST, AMBIENT LIGHTING (3 COLORS), Window Grid Antenna, Wheels: 18 5-Spoke (R31), Valet Function, Urethane Gear Shift Knob, Turn-By-Turn Navigation Directions, Trunk/Hatch Auto-Latch, Trip Computer, Transmission: 9G-TRONIC 9-Speed Automatic -inc: DYNAMIC SELECT, Transmission w/TouchShift Sequential Shift Control w/Steering Wheel Controls, Tracker System, Towing Equipment -inc: Trailer Sway Control, Tires: P235/60R18 Run-Flat, Tire Specific Low Tire Pressure Warning, Tailgate/Rear Door Lock Included w/Power Door Locks, Systems Monitor, Smart Device Integration. 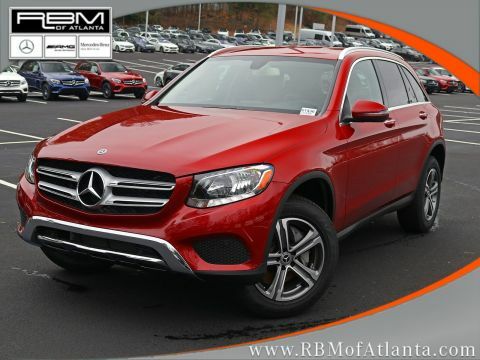 *Stop By Today *Come in for a quick visit at RBM of Atlanta, 7640 Roswell Road, Atlanta, GA 30350 to claim your Mercedes-Benz GLC! WHEELS: 19 5-SPOKE -inc: Tires: P235/55R19 Run-Flat, WHEEL LOCKS, STATIC LED HEADLAMPS, SMARTPHONE INTEGRATION PACKAGE -inc: Android Auto, Apple CarPlay, Smartphone Integration, SILK BEIGE/BLACK MB-TEX, MB-TEX UPHOLSTERY, SADDLE BROWN/BLACK, LEATHER UPHOLSTERY, PRE-WIRING FOR REAR SEAT ENT & COMFORT ADAPTER, PREMIUM PACKAGE -inc: KEYLESS GO, SiriusXM Satellite Radio, PORCELAIN FABRIC HEADLINER, PARKING ASSISTANCE PACKAGE -inc: HANDS-FREE Comfort Package, Parking Package, PARKTRONIC w/Active Parking Assist, Surround View Camera System, HANDS-FREE ACCESS. This Mercedes-Benz GLC has a dependable Intercooled Turbo Premium Unleaded I-4 2.0 L/121 engine powering this Automatic transmission. *This Mercedes-Benz GLC GLC 300 Has Everything You Want *HEATED FRONT SEATS, DESIGNO CARDINAL RED METALLIC, DARK BROWN LINDEN WOOD TRIM, BLIND SPOT ASSIST, AMBIENT LIGHTING (3 COLORS), Window Grid Antenna, Wheels: 18 5-Spoke (R31), Valet Function, Urethane Gear Shift Knob, Turn-By-Turn Navigation Directions, Trunk/Hatch Auto-Latch, Trip Computer, Transmission: 9G-TRONIC 9-Speed Automatic -inc: DYNAMIC SELECT, Transmission w/TouchShift Sequential Shift Control w/Steering Wheel Controls, Tracker System, Towing Equipment -inc: Trailer Sway Control, Tires: P235/60R18 Run-Flat, Tire Specific Low Tire Pressure Warning, Tailgate/Rear Door Lock Included w/Power Door Locks, Systems Monitor. * Visit Us Today *Stop by RBM of Atlanta located at 7640 Roswell Road, Atlanta, GA 30350 for a quick visit and a great vehicle!WHEELS: 19 5-SPOKE -inc: Tires: P235/55R19 Run-Flat, WHEEL LOCKS, STATIC LED HEADLAMPS, SMARTPHONE INTEGRATION PACKAGE -inc: Android Auto, Apple CarPlay, Smartphone Integration, SILK BEIGE/BLACK MB-TEX, MB-TEX UPHOLSTERY, SADDLE BROWN/BLACK, LEATHER UPHOLSTERY, PRE-WIRING FOR REAR SEAT ENT & COMFORT ADAPTER, PREMIUM PACKAGE -inc: KEYLESS GO, SiriusXM Satellite Radio, PORCELAIN FABRIC HEADLINER, PARKING ASSISTANCE PACKAGE -inc: HANDS-FREE Comfort Package, Parking Package, PARKTRONIC w/Active Parking Assist, Surround View Camera System, HANDS-FREE ACCESS. This Mercedes-Benz GLC has a dependable Intercooled Turbo Premium Unleaded I-4 2.0 L/121 engine powering this Automatic transmission. *This Mercedes-Benz GLC GLC 300 Has Everything You Want *HEATED FRONT SEATS, DESIGNO CARDINAL RED METALLIC, DARK BROWN LINDEN WOOD TRIM, BLIND SPOT ASSIST, AMBIENT LIGHTING (3 COLORS), Window Grid Antenna, Wheels: 18 5-Spoke (R31), Valet Function, Urethane Gear Shift Knob, Turn-By-Turn Navigation Directions, Trunk/Hatch Auto-Latch, Trip Computer, Transmission: 9G-TRONIC 9-Speed Automatic -inc: DYNAMIC SELECT, Transmission w/TouchShift Sequential Shift Control w/Steering Wheel Controls, Tracker System, Towing Equipment -inc: Trailer Sway Control, Tires: P235/60R18 Run-Flat, Tire Specific Low Tire Pressure Warning, Tailgate/Rear Door Lock Included w/Power Door Locks, Systems Monitor. * Visit Us Today *Stop by RBM of Atlanta located at 7640 Roswell Road, Atlanta, GA 30350 for a quick visit and a great vehicle!